When you are trying to deliver insights that will help clinicians identify tailored treatments for children with high risk cancers, using basic spreadsheets to collate and analyse information doesn’t quite cut it. This is exactly what researchers at the Children’s Cancer Institute were using to store and study operational and numerical data that is generated from experiments using genomic information. Blood and tissue sample data sent from the Sydney Children’s Hospital, Westmead Children’s Hospital and others around Australia to the Institute’s ‘biobank’ were catalogued for researchers using basic SQL reporting services reports, spreadsheets, and application-specific reporting tools. The ‘Biogenix’ open source legacy system used to store biological information also had incredible limitations, Elaine Neeson, head of technology at the Children’s Cancer Institute told CIO Australia. “As the research progressed a lot of the work became too complex for this system to actually handle. It was taking our team hours and hours to come up with a list of the [genomic] samples that we had. There were a lot of errors – people would say we had samples of a particular disease when we actually didn’t because data had been entered incorrectly,” she said. Improving the accuracy of reporting will be even more vital when the ‘Zero Childhood Cancer’ program is rolled out nationally between 2017 and 2020. Announced last year by the institute and Sydney Children’s Hospitals Network, this personalised medicine program will identify treatments for children with high risk cancer. The program has increased the need for the institute’s operational data to be highly accessible to users as it is scaled up and samples are received from every children’s hospital in Australia. To help it cope with this expected demand, the Institute has deployed Yellowfin business intelligence and analytics software. This database-independent data analysis tool lets researchers and business users produce reports that offer insights across the research, operational, and business aspects of the organisation. Users can pull data out of the legacy system and the web-based Biofortis LabMatrix clinical research management system and determine at any point in time how many samples exist for any particular disease type. Biofortis LabMatrix was deployed in April this year for general biobanking and will be used for personalised medicine from 2017 onwards, Neeson said. The Zero Childhood Cancer program will need to raise $50 million over the next five years to make it a national clinical tool. “For them [the institute’s fundraising department] to reach $50 million, they need to know, at the push of a button, how campaigns are travelling. We need to know if something is not working … we need to change what we are doing so it’s more profitable to us as well,” said Neeson. Neeson said the institute has used the popular Raiser’s Edge fundraising system for reporting but this software doesn’t have the predictive analytics capabilities that are provided by the Yellowfin software. “We are trying to get down the nitty gritty of what makes a fundraising campaign successful. What are the drivers that make a campaign successful? What are the triggers that mean it is going to fail?” said Neeson. “Our biggest insights would be on KPIs [key performance indicators] for campaigns – we input and measure against them. If they start a new campaign, we can see in real time where donations are at, how much people are fundraising at any point in time, and also who is lagging so we can market our communications to generate more interest,” she said. Meanwhile, genomic data analysis is completed on a much larger scale by two bioinformaticians using open source applications that run on high performance computers at the institute. 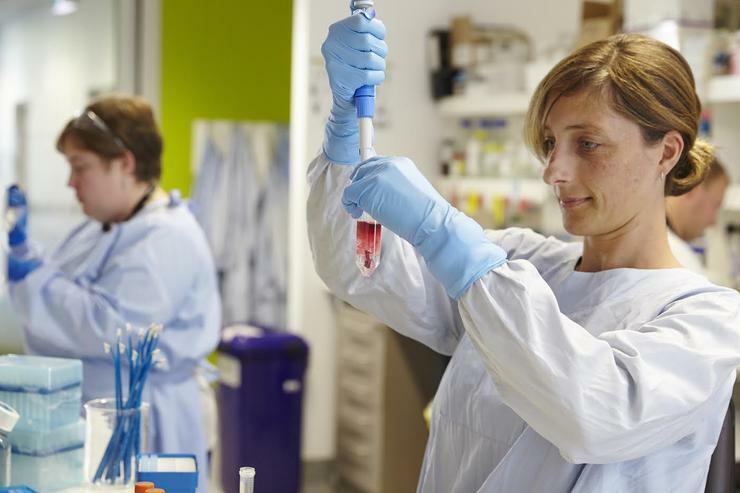 The Institute also uses bioinformatics capabilities provided by Melbourne’s Peter MacCallum Cancer Centre, and the Garvin Institute of Medical Research in Sydney. “We are also accessing the NECTA Cloud and slowly moving into accessing the Microsoft Azure and Amazon Web Services research clouds as well. Every patient generates about 1.5TB of data per consultation. If they relapse, that’s another 1.5TB so by 2020, I am looking at well over 1PB of data," Neeson said. In 2018, the Institute will feed data from its partners and other collaborators across the country and overseas into its data warehouse and use the Yellowfin software to complete reports for the Zero Childhood Cancer program. Researchers will make clinical decisions based on this information. "We have a drug discovery centre at the institute where [researchers] will be running tests against every individual's cancer to determine what drug could work for that patient. At the moment, treatments for childhood cancers are not tailored and many of the children are treated with adult drugs," said Neeson. "That has lifelong effects for them. One of our clinicians often says that his ward is filled with patients suffering from the side effects of their treatment. This program will tailor specific treatments to individual tumours which we have never been able to do before because we've never had the capability to do genomic analysis as easily as we do now."